The eBay Bucks Rewards Program is designed to reward eBay members for purchasing items on www.ebay.com. Members can accrue eBay Bucks based on qualifying purchases. Upon the completion of each calendar quarter, you will receive a reward equal to the amount of your eBay Bucks accrued during that calendar quarter in the form of an eBay Bucks Certificate. You can use this Certificate to buy more things on eBay! To maintain the performance of the eBay Bucks Rewards Program, we conduct regular audits of program benefits. The results of these audits may lead to program changes and updates to the program terms, including the changes we are implementing as of January 1, 2017. Do I need to earn $5.00 or more in a calendar quarter to receive my eBay Bucks Certificate? No, you will receive an eBay Bucks certificate that reflects whatever earn you accrue in a calendar quarter. Can I transfer my balance to another eBay Bucks member? Where can I get information on the eBay Bucks Rewards Program in Canada? The eBay Bucks program is available to Canadian residents. For more information, please visit this page. Are there any rewards programs for eBay users not in the United States? If you are a resident of the United Kingdom, you may be eligible to earn rewards through Nectar. You can join by enrolling or simply by responding to an invitation email that eBay may send from time to time. Earning eBay Bucks is easy! After you enroll, start shopping on eBay and you'll automatically earn eBay Bucks on qualifying purchases. Earn eBay Bucks during a calendar quarter and you will receive an eBay Bucks Certificate for the total amount earned after that quarter ends. PLEASE NOTE: While eBay Bucks can't be earned on purchases in these categories, the eBay Bucks Certificates can still be used for redemption in these categories, except eBay Gift Cards within the Gift Cards & Coupons category. See complete details on redemption. How is the base earn amount determined for a qualifying purchase? What is the base earn percentage? The base earn percentage is the percent amount used to calculate how many eBay Bucks a member will earn on qualifying purchases. The base earn percentage is 2% until December 31, 2016. Effective January 1, 2017, the base earn percentage will be 1%. Are all aspects of my qualifying purchase included in the calculation? eBay reserves the right to change the base earn percentage up or down. From time to time, eBay may offer special promotions, including bonus offers and selling offers, that would provide members with extra eBay Bucks or an additional earn percentage in addition to the base earn percentage for qualifying purchases during the promotion period. If your purchase qualifies for multiple promotions, you will automatically earn credit for the highest value promotional offer. How do I know if I am signed up to receive emails from eBay Bucks? By signing up for general email promotions, you will receive emails from eBay Bucks. How do I find out about promotions that might affect how much I earn? Most promotions are sent via email to the email address you have listed in your account. Are there any limitations on how many eBay Bucks I can earn? You can earn up to $100 in eBay Bucks on any single eBay purchase. This means that if the eBay Bucks earn percentage is 1% and the purchase price (excluding tax, shipping fees) is in excess of $10,000, you would be restricted from earning any more eBay Bucks for that purchase beyond the $100 eBay Bucks purchase earn limit. You can earn up to $500 in eBay Bucks for all qualifying purchases during a given calendar quarter. This means that if the eBay Bucks earn percentage is 1% and the total value of qualifying purchases exceeds $50,000 during a given calendar quarter, you would be restricted from accumulating any more eBay Bucks beyond the $500 eBay Bucks quarterly earn limit. When can I earn and redeem my eBay Bucks? You can earn eBay Bucks throughout each calendar quarter. For example, you can earn eBay Bucks from January 1 through March 31. Then a new earn period starts on April 1 and runs through June 30. Your eBay Bucks Certificate will appear in your account approximately 15 days after the quarter ends. Can I earn eBay Bucks while taking advantage of another eBay promotional program? Yes, you may earn eBay Bucks in conjunction with most other eBay promotions such as while using an eBay Coupon. When are my eBay Bucks posted to my account? eBay Bucks are posted after you purchase and pay for your item(s) (either auction-style or Buy It Now). I received an extra eBay Bucks promotional offer; when will my eBay Bucks be posted to my account? On promotion day(s), you must purchase and pay (and/or sell depending on the promotion) for your item(s) on that same day(s) to qualify for the extra eBay Bucks. Can I earn eBay Bucks without a PayPal account? Yes! 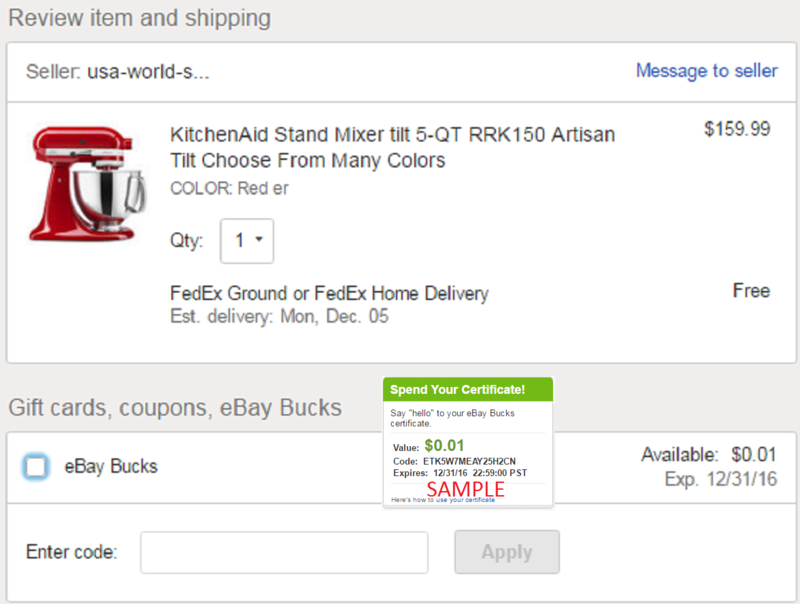 You can pay for qualifying purchases to earn eBay Bucks. How can I check my eBay Bucks balance? Go to My eBay and click "eBay Bucks" under the "Buy" heading in the left-hand menu bar to see your qualifying purchase activity and balance or click here. Why does my eBay Bucks account show a negative balance? You likely returned an item after you spent the eBay Bucks Certificate that you earned for it. This often happens when you purchase an item in one quarter, spend the eBay Bucks Certificate you earned for buying that item, and then returned that item. Any future purchases will be offset against that negative balance as you continue to earn eBay Bucks. Why does my eBay Bucks show $0.00? At the beginning of each calendar quarter, your eBay Bucks amount listed in the left navigation bar on the My eBay page will reset to $0.00. If you have earned eBay Bucks the previous quarter, we will process your eBay Bucks Certificate and make it available to you in approximately fifteen (15) days. You can check to see if the Certificate has been issued by scrolling down to the Activity section on the eBay Bucks page under My eBay. Why does My eBay show less eBay Bucks than I expected? The eBay Bucks page in My eBay shows your activity for the current quarter, and the eBay Bucks you've earned on purchases. If your purchase has not posted here yet, please wait 48 hours for it to clear. In the rare event that your purchase still doesn't post here after 48 hours, please contact Customer Service. Some purchases may not qualify for eBay Bucks or may be subject to a restriction. You may be able to identify these purchases as the amount in the earn column should be displayed as a hyperlink. Click that link to learn more about the reason for the restriction. You should also know that from time to time, purchases may be subject to review, so what first appears as a "$0.00" earning could turn into the earn amount you expected. If you return a purchase, the eBay Bucks earned for that purchase will be deducted from your eBay Bucks balance total. If the return occurred in the next earn period, you may even start off with a negative balance. When will I get my eBay Bucks Certificate? If you earn eBay Bucks in a calendar quarter, you will get your eBay Bucks Certificate approximately 3–15 days after the end of the quarterly earn period. Please check the eBay Bucks page in My eBay; keep an eye on the "Certificates" section. You will also receive an email when your Certificate is ready to be redeemed. Where can I redeem my eBay Bucks Certificate? You can redeem your Certificate for any qualifying item on eBay.com. See Terms & Conditions for details and restrictions. How do I redeem my eBay Bucks Certificate? Continue to the eBay checkout page and pay for your item by the expiration date. Your Bucks certificate will appear by the item subtotal. Click to apply your certificate on the eBay checkout page. How long do I have to redeem my eBay Bucks Certificate? Your eBay Bucks Certificate is valid for 30 days. Please check your eBay Bucks Certificate for specific dates. Your unredeemed eBay Bucks Certificate will expire after the 30 day redemption period. 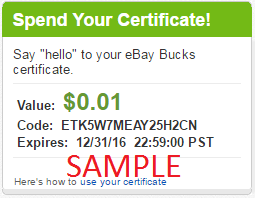 Can I give or sell my eBay Bucks Certificate to another member? No, eBay Bucks Certificates may only be redeemed by the member it was issued to. eBay Bucks Certificates are non-transferable. Can I donate my eBay Bucks? No, at this time, you cannot donate your eBay Bucks Certificates. The eBay Bucks Certificates may only be redeemed for purchases on eBay by the member who received them. What do I do if my eBay Bucks Certificate isn't available at checkout? Some restrictions apply; see Terms & Conditions for details. What if I pay for an item with my eBay Bucks Certificate and I return that item? Do I lose my eBay Bucks? No, you do not lose your eBay Bucks Certificate. When you return the item, we will re-issue your eBay Bucks Certificate and you will then have either 21 days or until the end of the existing redemption period (whichever is longer) to spend your eBay Bucks Certificate. No, there is no impact to seller fees as a result of this Program. Are my listings eligible for eBay Bucks? You don't have to do anything. eBay Bucks members will see the eBay Bucks offer as long as a seller's item qualifies for eBay Bucks. Please note that as the seller, you will not see eBay Bucks information for your own inventory. This is because as a seller you can't buy your own items and you also would not earn Bucks in these cases. How can I verify that eBay Bucks are offered on my items? Should I mention eBay Bucks in my item listings? Since participation is voluntary, not all eBay members will be participating in the eBay Bucks Rewards Program. Therefore, we strongly discourage you from mentioning eBay Bucks in your listings as some eBay members who are not eBay Bucks members may get confused and hesitate to buy from you. How can I make sure that eBay Bucks members can earn eBay Bucks when they purchase my listing? As long as your items are not listed in any of the restricted categories (see Terms & Conditions for details) you don't have to do anything for members to earn eBay Bucks from your listing. Can I participate as a buyer? Absolutely. eBay recognizes that many of its best sellers are also buyers on the eBay site. But please note that only one eBay Bucks account per person is allowed. Therefore, we recommend you enroll the account that you use for buying in the eBay Bucks Rewards Program.